This guide outlines how to connect to, and how to export to MYOB Exo. This guide outlines the process of exporting your timesheets from Deputy to MYOB EXO. Please note that the export is a file download/upload into MYOB EXO, and not a direct export. Please ensure that you have timesheets ready to be exported. Also, ensure that you have a valid MYOB EXO account before getting started. Please ensure that pay rates are set within Deputy for each employee that is being exported. 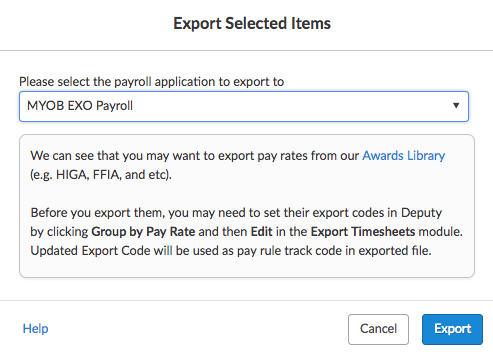 Addtional note: The 'IMPORT TIME TRANSACTIONS' option must be enabled before you can export to MYOB EXO. This can be found in the 'Other Setup' section of MYOB EXO's Setup Payroll window. To start, navigate to the 'Export Timesheets' section within Deputy. 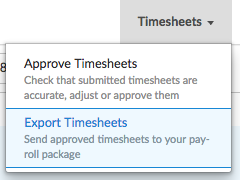 Now select the timesheets you would like to export. After selecting the timesheets you would like to export, click 'Export Selected Items' as seen below. Now select MYOB EXO Payroll from the list of payroll systems, then click 'Export'. Deputy will now take some time to generate the MYOB EXO export file. The following message will appear when the file is successfully generated. A file will be downloaded after you click 'Download File'. This file will be named 'TIMETRAN'. 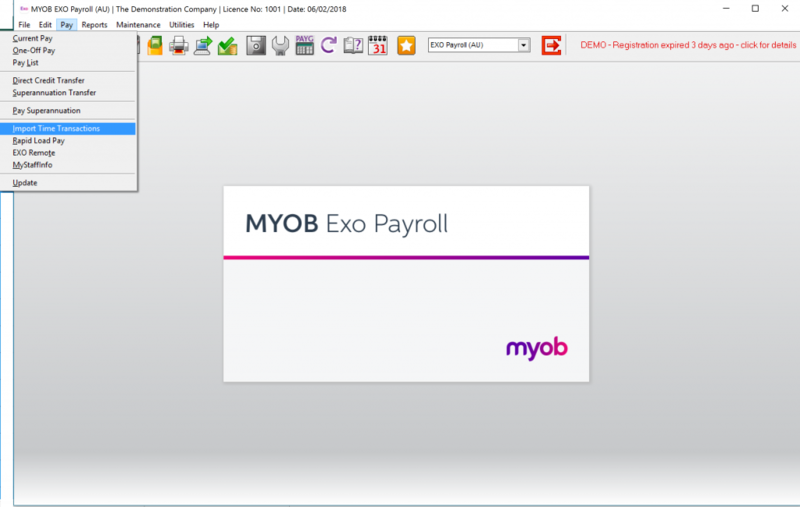 You will need to locate this file on your computer and copy it to your MYOB EXO payroll folder. The default location for this folder is C:payrollv. Please note: Do not rename this file, as it will not be imported into MYOB EXO under any other name. After saving the TIMETRAN file in the correct folder, open up MYOB EXO. To ensure that the hours imported are correct, navigate to the 'Pay Details' section of MYOB EXO and cloc 'Reset All'. This will reset all hours and values to zero. This is a simple way to ensure that the data is clear and to check if the import was successful/correct. From checking this, click 'Pay' at the top and select 'Import Time Transactions'. After the file has been imported, navigate back to the 'Pay Details' section and the values will have updated based on the exported Deputy data. You are now ready to perform your pay run. After syncing your employees from MYOB to Deputy, you will need to match up the employee ID codes between the two systems to ensure that MYOB EXO maps the correct employee to the correct pay rate. 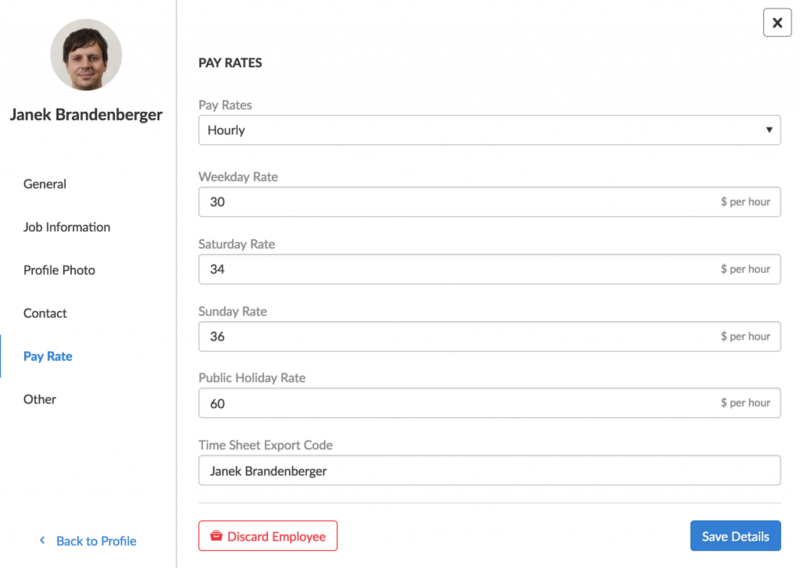 To check this, navigate to an employee's Deputy profile, and take note of the employee's Time Sheet Export Code. Now after syncing employees into MYOB EXO, navigate to the Employee List and ensure that each employee code matches up to their employee code within Deputy. 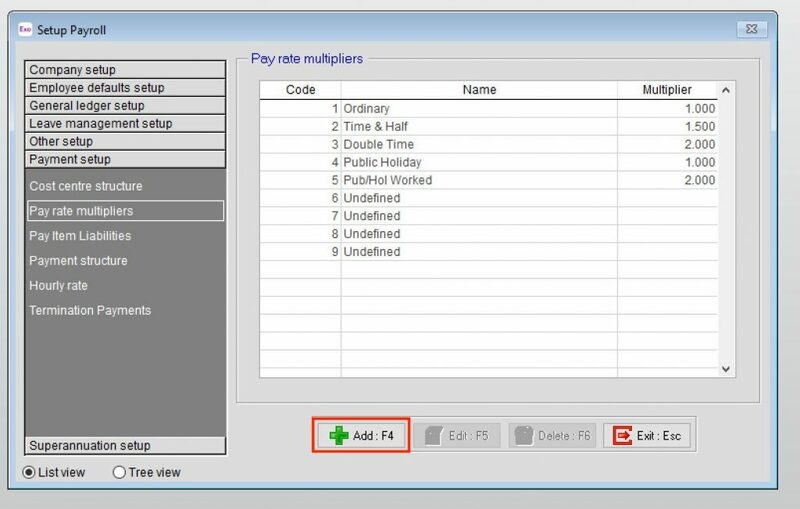 The export from Deputy supports an unlimited number of pay rate multipliers and 5 different types of Wage values. 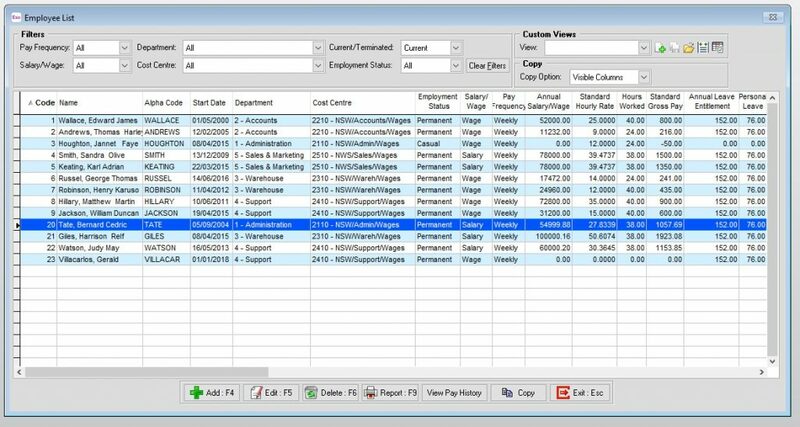 To edit these values, navigate to the Export Timesheets section and after selecting an employee, click 'Group By Pay Rate', then clicking 'Edit' on the pay rate you would like to specify. You will need to use any of the codes used below, which allows Deputy to save the pay rate/type in a way that MYOB EXO can read and successfully import it. To add a new multiplier, click on any of the undefined multipliers and click 'Edit'. To add additional multipliers, simply click 'Add'.